Satellite Data System (SDS) spacecraft are communication relay satellites for transmiting real-time data from US reconnaissance satellites (e.g. KH-11) in polar areas. They are also used for communications to USAF air craft on polar routes and connect the various ground stations of the Air Force Satellite Control Network (AFSCN). The spacecraft relay the downlinked KH-11 data to a ground station at Fort Belvoir, Virginia. Like their SDS predecessors, the most of the SDS-2 spacecraft are in highly elliptical Molniya orbits of 368 × 39700 km at an inclination of 57° to 63°, but one (#2) appears to have a geostationary position. The SDS-2 are reported to carry the HERITAGE (Radiant Agate) infrared early warning system for detection of ballistic missile launches. The inclusion of this package has not been confirmed. Hughes has continued as the main contractor of the SDS-2 program. The SDS-2 program is operated by the Consolidated Space Test Center. The Shuttle payload envelope has defined the satellite's design. The SDS-2 features two 15 ft diameter dish antennas and a third dish (6.6 ft in diameter), which serves as a K-band antenna downlink. The SDS-2 has two more antennas, one that is used for uplink communications, and another that is a telemetry and command antenna, which is used as a back-up. The body itself, appears to based on the HS-389 (Intelsat 6) or the HS-381 (Leasat) bus and has likely the designation HS-386. It was designed to be launched by the Shuttle, although the fourth was launched by a Titan-4(05)A. They probably used an Orbus-21S or a TU-882 kick motor to leave low earth orbit. The SDS-2 cylindrical drop-skirt solar array generates 1,238 Watts of power with support from three 25-amp-hour nickel-cadium batteries. 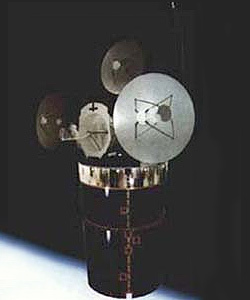 NRO unveiled in March 1998 photographs, which most probably show the SDS-2 spacecraft. The code-name QUASAR has confirmed by leaked budgets in 2013 to be associated with these satellites. A fifth satellite was apparently built, but not launched. The bus was donated in March 2017 to NASA as NSTP-Sat (NASA Science/Technology Platform Satellite) for a prurpose to be determined. Note: The numbering is not sure, as it is not confirmed, how many first generation Quasar were launched. Possibly Quasar 12 could be part of this second generation too.